Asbestos is the name of a group of highly fibrous minerals with separable, long, and thin fibers. Asbestos is also a known carcinogen. It is found in most buildings built in throughout the United States before 1980 and is still used today in several products frequently used in construction. In response, Federal, State, and local agencies have enacted regulations to protect the health and safety of building employees, occupants and contractors. Many older homes and buildings in the New England area contain asbestos, which was used in spray-applied flame retardant, thermal system insulation, and in a variety of other materials such as vinyl tiles, ceiling tiles, and insulation. The only way to know if a material contains asbestos is to remove it and have it tested in a competent laboratory. Asbestos floor tiles, however, are more difficult to remove than sidings and ceilings. This is because they have a tendency to break and chip off which increases the likelihood of toxic fibers escaping and spreading in the air. 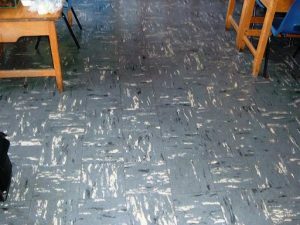 Ordinarily, undamaged and intact asbestos floor tiles pose no threat Asbestos Floor Tileto a person’s health. The threat occurs when time and continued exposure to the elements eventually wear down and release the friable asbestos fibers. At this stage, asbestos fibers can become a serious threat to human health. Some forms of asbestos have been known to cause tumors and forms of cancer in humans and animals. Asbestos exposure becomes a health concern when high concentrations of asbestos fibers are inhaled over a long period of time. 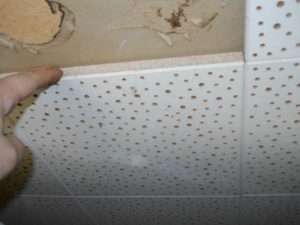 Health risks occur when structural materials such as pipe wrapping, tiles, or insulation are ripped, broken, or disturbed in the living area or workplace. Age, demolition and water damage are some of the factors that could cause a problem unless addressed properly and professionally. Click this link to go to the US Consumer Protection Safety Commission website to learn more about asbestos in the home. 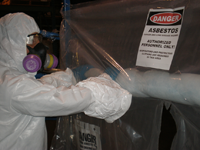 Asbestos abatement is State regulated and therefore, requires by law, a certified asbestos abatement contractor, like Single Source, to perform the abatement. We can remove, decontaminate, encase, encapsulate, transport and dispose of your asbestos-containing materials. Proper containment and negative air systems are used to environmentally control your project. Abatement includes all actions necessary to control any hazards posed by the presence of asbestos. All asbestos abatement is done in accordance with the strictest of industry and governmental protocols. The abatement work procedures are carefully planned to ensure that any person outside the controlled area will not be at risk. Our workers wear all appropriate protection inside the work area. Preparation involves setting up an enclosure with plastic sheeting, sealing all windows, doors, ventilation ducts, and other openings to prevent the spread of asbestos fibers. The work area will be placed under negative air pressure to ensure that no air will leak from the controlled area into adjacent areas. Removal is done in such a way as to minimize the disturbance of the material. Water may be used to prevent harmful dust from spreading. The abated material is placed in commercial grade plastic bags and then disposed of appropriately, according to local government regulations. If you suspect there is asbestos in your home, please contact us for a free consultation. To expedite the consultation process, it would be extremely helpful if you could upload pictures/images of the areas of concern via our contact form.